When mind and heart are united in prayer and the soul is wholly concentrated in a single desire for God, then the heart grows warm and the light of Christ begins to shine and fills the inward man with peace and joy. We should thank the Lord for everything and give ourselves up to His will; we should also offer Him all our thoughts and words, and strive to make everything serve only His good pleasure. Prayer is a great weapon, a rich treasure, a wealth that is never exhausted, an undisturbed refuge, a cause of tranquillity, the root of a multitude of blessings and their source. Prayer is a conversation directly with God, being always with God, having one’s soul united with Him and one’s mind inseparable. A person becomes one with the angels and unites with them in perpetual praise and longing for God. Having risen from sleep, we worship You, blessed God, and sing to You, mighty Lord, the angelic hymn: Holy, holy, holy are You, O God; through the prayers of the Theotokos, have mercy on us. Having awakened me from sleep, Lord, enlighten my mind and heart. Open my lips to praise You Holy Trinity: Holy, holy, holy are You, O God; through the prayers of the Theotokos, have mercy on me. Suddenly the Judge will come and the deeds of all will be revealed. Therefore, early in the morning let us cry out in awe: Holy, holy, holy are you, O God; through the prayers of the Theotokos have mercy on us. Listen to me when I call to you. Receive my prayer as incense, my lifted hands as an evening sacrifice. Now that the day has ended, I thank you Lord, and I ask that the evening and the night be sinless. Grant this to me, O Savior, and save me. Now that the day has passed, I glorify you, O Master, and I ask that the evening and the night be without offense. Grant this to me, O Savior, and save me. Now that the day has run its course, I praise you, O Holy One, and I ask that the evening and the night be undisturbed. Grant this to me, O Savior, and save me. Lord, God our Father, if during this day I have sinned in word, deed or thought forgive me in Your goodness and love. Grant me peaceful sleep; protect me from all evil and awake me in the morning that I may glorify you, Your Son and Your Holy Spirit now and forever and ever. Amen. Christ our God, who is worshipped and glorified at all times and in every hour in heaven and on earth; who is most patient, loving and kind; who loves the just and shows mercy to sinners; who calls all to salvation through the promise of the blessings to come; Lord, at this time receive our prayer and direct our lives according to Your will. Bless our souls and bodies. Correct our thoughts and purify our minds. Protect us from all evil and distress. Surround us with Your holy angels, that guided and guarded by them, we may attain the unity of the faith and the knowledge of Your unapproachable glory, for you are blessed forever and ever. Amen. Lord, into Your hands I commend my soul and body. Bless me, be merciful to me and grant me life eternal. Amen. Christ, the true Light, You enlighten and sanctify every man. May Your light shine in us that we may see Your radiance. Help us to live according to Your commandments, through the prayers of Your all-pure Mother and all Your Saints. Amen. Lord God, Almighty Father, Only Son, Lord Jesus Christ and Holy Spirit, one God and one Power, have mercy on me a sinner and save me Your unworthy servant according to the ways of Your wisdom, for You are blessed forever and ever. Amen. God, Maker of all creation, accept these prayers of appreciation and petition from us sinners, and deliver us from any fatal fall into darkness and from all enemies, visible or invisible. Lord, who loves everyone, by Your great mercy, You have sent Your only son, our Lord, Jesus Christ, for the salvation of all, and by Your Holy Cross, have cancelled the debt of our sins and defeated the powers of darkness. Penetrate our bodies with Your power and wrap our hearts with love in You, that we might always gaze upon You and be guided by Your eternal light. We give unending praise and thanks to You, eternal Father, to Your only Son and to Your all-holy, good and life-giving Spirit, now and forever and ever. Amen. Master, Lord Jesus Christ our God, who patiently endured our sins and led us to this hour, at which You were hung on the life-giving Cross, who opened the way to Paradise for the penitent thief and destroyed death by Your death, have mercy on us Your sinful and unworthy servants. We have sinned and violated Your law; we are unworthy to lift up our eyes and look into the heights of heaven, for we have forsaken the path of Your righteousness and have walked according to the desires of our hearts. But now we beg You in Your abundant goodness; spare us, Lord, in Your great mercy and save us for the glory of Your Holy Name, for our days were spent in vain. Save us from the hand of the enemy, forgive our sins and destroy the desires of our flesh, that we might live anew in You, our Master and Benefactor. Help us follow Your commandments, and attain eternal rest, where all the blessed dwell. For You are truly the joy of all those who love You, Christ our God, and we glorify Your eternal Father and Your all holy, good and life-giving Spirit, now and forever and ever. Amen. And in one Lord, Jesus Christ, the only begotten Son of God, begotten of the Father before all ages. For us and for our salvation, He came down from heaven and was incarnate by the Holy Spirit and the Virgin Mary and became man. He will come again in glory to judge the living and the dead. His Kingdom will have no end. who together with the Father and the Son is worshiped and glorified, who spoke through the prophets. I expect the resurrection of the dead. And the life of the age to come. Amen. Christ our God, bless us Your servants, our home, the food and drink before us for You are the Source of all blessings, now and forever and ever. Amen. Lord Jesus Christ our God, You blessed the five loaves in the wilderness and fed the multitudes of men, women and children. Bless also these Your gifts and increase them for the hungry people in the world. You are the One who blesses and sanctifies all things and to You we give glory forever. Amen. The hungry shall eat and shall be satisfied. Those who seek the Lord shall praise Him; their hearts shall live forever. Bless us Lord and Your gifts which we are about to receive. You are blessed and glorified forever. Amen. We thank you, Christ our God, for providing us with Your earthly gifts. Deprive us not of Your heavenly Kingdom. Lord, as you entered among Your disciples to give them peace, enter among us, give us Your peace and save us. Amen. Glory to You, Lord and King! You have gladdened our hearts through Your earthly gifts. Fill us also with the gift of Your Holy Spirit, that we may abound in every good work to the glory of Your name. Amen. We thank You Lord, Giver of all good things, for these Your gifts and all Your mercies, and we bless Your holy name forever. Amen. Leader: May the grace or our Lord Jesus Christ and the love of God the Father and the fellowship of the Holy Spirit be with you. All: You have given us grace at this time to offer You a common prayer together and have promised that when two or three are gathered together in Your name, that You will grant their requests; fulfill, Lord, the prayers of Your servants, which are for our welfare, grant us the knowledge of Your truth in this world and life everlasting in the world to come. Amen. O God, our heavenly Father, who loves mankind and are a most merciful and compassionate God, have mercy upon Your servants (Name those whom you wish to remember) for whom I humbly pray to You to care for and protect. O God, be their guide and guardian in all their endeavors, lead them in the path of Your truth, and draw them nearer to You, so that they may lead a godly and righteous life in Your love as they do Your will in all things. Give them Your grace, and mercy so that they may be patient, hard working, tireless, devout and charitable. Defend them against the assaults of the enemy, and grant them wisdom and strength to resist all temptation and corruption, and direct them in the way of Salvation, through the goodness of Your Son, our Savior Jesus Christ, and the prayers of His Holy Mother and the blessed saints. Amen. Heavenly Father, bless my parents and all those who love and care for me. Help me in all ways to be respectful and obedient to them according to Your will. Send down upon me Your grace to perform all my duties carefully and faithfully, to avoid unacceptable company and influence and to resist all temptation that may come my way. Help me Lord to live a serious, good and godly life, praising You constantly and glorifying Your holy Name. Amen. Jesus loves my _______ . Thank you God, for _______ . Lord Jesus Christ, by Your presence You blessed the wedding in Cana and showed us that You are the true priest of mystical and pure marriage. We thank You for the day on which by Your heavenly blessing You joined us in the sacrament of marriage. Lord, continue to bless and enrich our marriage in love companionship, mutual support, oneness of heart and progress in faith and life. Protect our Holy wedlock from sin, evil and danger. Nurture between us the spirit of understanding, the spirit of forgiveness and the spirit of peace, that no resentment, quarrel or other problem may cause us to stumble and fall. Grant us to see our own faults and not to judge each other. Keep our bond of love always new. Gladden our lives with the joys of marriage, that with one heart we may praise and glorify You. Amen. Jesus my Lord, Who became man and graced us with the beauty of Your life and with the example of faith, purity and love; help me, I pray, to love You with all my mind, heart and soul, and to live according to Your teachings. Strengthen me when temptations strike, that I may remain pure in thought and steadfast in virtue, doing only things that are pleasing to You. Guide me to live Your will and not my own as I look to the future. Grant me faith, courage and love, that I may serve You in holiness all the days of my life, through the prayers of the Theotokos and of all the Saints. Amen. Master who loves us, shine Your eternal light in our hearts that we may better know you. Help us to fully understand Your gospel message. Instill in us respect for Your holy commandments, that by overcoming our worldly desires we might life a spiritual life of thoughts and deeds which pleases You. We ask this of You, O Christ our god, for You are the light of our souls and bodies and You we glorify with Your eternal Father and Your all-holy good and life-giving Spirit now and forever. Amen. Lord, Jesus Christ my God, forgive the faults and sins which I, Your unworthy servant have committed from my youth to this day and hour, whether knowingly or in ignorance, whether by words, deeds, intentions or thoughts and whether by habit or through any of my senses. By the prayers of Your pure and Virgin Mother, make me worthy without condemnation to receive Your precious, immortal and life-giving Mysteries for the forgiveness of sins and eternal life. May the Eucharist sanctify, enlighten, strengthen and heal my soul and body and thus destroy my evil thoughts, intentions and prejudices. For Yours, Christ our God, is the Kingdom, the power, the glory, the honor and worship with the Father and the Holy Spirit, now and forever and ever. Amen. Master and Lord, Jesus Christ our God, You alone have authority to forgive my sins, whether committed knowingly or in ignorance, and make me worthy to receive without condemnation Your divine, glorious, pure and life-giving Mysteries, not for my punishment, but for my purification and sanctification, now and in Your future Kingdom. For You, Christ our God are compassionate and love mankind and to You we give glory with the Father and the Holy Spirit now and forever and ever. Amen. Lord Jesus Christ, my God, now that I have received Your holy Body and Blood, grant me forgiveness of my sins and life everlasting. I thank You, loving Master, benefactor of my soul, that on this day You have again made me worthy of Your heavenly and immortal mysteries. Direct my way on the right path. Establish me firmly in Your fear. Guard my life. And make my endeavors safe, through the prayers of the glorious Theotokos and ever-virgin Mary and of all Your Saints. Amen. Lord Jesus Christ my God, let Your sacred Body be unto me for eternal life and Your precious Blood for forgiveness of sins. Let this Eucharist be unto me for joy, health and gladness. And in Your awesome Second Coming make me, a sinner, worthy to stand at the right hand of Your glory; through the intercessions of Your pure Mother and of all Your Saints. Amen. Priest: Blessed is our God, always both now and forever and to the ages of ages. Priest: Glory to You, Christ our God, our hope, Glory to You! Heavenly King, Comforter, the Spirit of Truth, present in all places and filling all things, the Treasury of Blessings and Giver of life: come and abide in us. Cleanse us from all impurity and save our souls, O Good One. Priest: For Yours is the Kingdom and the Power and the Glory of the Father and the Son and the Holy Spirit, both now and forever and to the ages of ages. Having risen from sleep, we worship You, blessed God, and sing to You, mighty Lord, the angelic hymn: Holy, holy, holy are You, O God; through the prayers of the Theotokos have mercy on us. Having awakened me from sleep, Lord, enlighten my mind and heart. Open my lips to praise You Holy Trinity: Holy, holy, holy are You, O God; through the prayers of the Theotokos have mercy on me. Priest: For the peace from above and the salvation of our souls, let us pray to the Lord. Priest: For the peace of the whole world, the stability of the holy churches of God, and for the unity of all, let us pray to the Lord. Priest: For this holy house, and for those who enter it with faith, reverence and the fear of God, let us pray to the Lord. Priest: For our Archbishop _______, our Bishop _______, the honorable presbyters, the deacons in the service of Christ, and all the clergy and laity, let us pray to the Lord. Priest: For our Youth Program, all those who participate and help and for their families, that the Holy Spirit may protect and strengthen their faith, let us pray to the Lord. Priest: For this city, for every city and country, and for the faithful who live in them, let us pray to the Lord. Priest: For travelers by sea, land and air, for the sick, the suffering, the captives and for their safety and salvation, let us pray to the Lord. Priest: For our deliverance from all tribulation, wrath, danger and necessity, let us pray to the Lord. Priest: Help us, save us, have mercy on us, and keep us, O God, by Your grace. Priest: Remembering our most holy, pure, blessed, and glorious Lady, the Theotokos and ever virgin Mary, with all the saints, let us commit ourselves and one another and our whole life to Christ our God. We give You thanks, Lord our God, for raising us from our bed and for putting words of praise into our mouths, that we may worship and invoke Your holy Name. We are in need of Your mercies, which You have always provided for our life. Now, too, send forth Your help to those who stand in the presence of Your holy glory, waiting for Your rich mercy. Grant that they may worship You always with awe and love; praising, singing, and glorifying Your inexpressible goodness. People: Amen. God is the Lord and has appeared to us. Blessed is He Who comes in the name of the Lord. Give thanks to the Lord, for He is good; for His steadfast love endures forever! God is the Lord and has appeared to us. Blessed is He Who comes in the name of the Lord. All nations surround me; in the name of the Lord I cut them off! Priest: Again in Peace let us pray to the Lord. Priest:Remembering our most holy, pure, blessed, and glorious Lady, the Theotokos and ever virgin Mary, with all the saints, let us commit ourselves and one another and our whole life to Christ our God. Priest:For Yours is the dominion, the kingdom, the power, and the glory of the Father and the Son and the Holy Spirit, now and forever and to the ages of ages. Priest: Let us honor and magnify in song the Theotokos the Mother of light! People: My soul magnifies the Lord, and my spirit has rejoiced in God my savior. More honorable than the Cherubim, and beyond compare more glorious than the Seraphim, without corruption you gave birth to God the Word. We magnify you, the true Theotokos. He has pulled down the mighty from their throwns and raised up those who were low; he has filled the hungry with good things and the rich he has sent away empty. People: Glory to God in the highest and on earth peace, good will among all. We praise You, we bless You, we worship You, we glorify You, we give thanks to You for Your great glory. Lord, King, heavenly God, Father almighty; Lord, the Only begotten Son, Jesus Christ, and Holy Spirit. Lord, God, Lamb of God, Son of the Father who takes away the sin of the world, have mercy on us, You who take away the sins of the world. Receive our prayer, You Who sit at the right hand of the Father, and have mercy on us. For You only are holy, You only are the Lord, Jesus Christ, to the glory of God the Father. Amen. Each day I will bless You and praise Your name forever. Lord, You have been our refuge from generation to generation. I have said: Lord, have mercy on me. Heal my soul for I have sinned against You. Lord, in You have I taken refuge. Teach me Your will, for You are my God. For in You is the source of life, and in Your light we shall see light. Extend Your mercy to those who know You. Grant, Lord, to keep us this day without sin. Blessed are You, Lord, God of our Fathers, and praised and glorified is Your name forever. Amen. Lord, let Your mercy come upon us, for we have trusted in You. Blessed are You, Lord, teach me Your commandments. Blessed are You, Holy One, enlighten me with Your commandments. Lord, Your love endures forever; do not turn away from the work of Your hands. To You belong praise, song, and glory, to the Father, and the Son and the Holy Spirit, now and forever and to the ages of ages. Amen. (the name of the book of the New Testament from which the Epistle reading is taken). Priest: Wisdom. Arise. Let us hear the holy Gospel. Peace be with you all. Priest: The reading is from the Holy Gospel according to (Name). Let us be attentive. Priest: Glory to You, O God, our hope, glory to You. May Christ our true God, as a good, loving, and merciful God, have mercy on us and save us, through the intercessions of His most pure and holy Mother; the power of the precious and life-giving cross; the protection of the honorable, bodiless powers of heaven, the supplications of the honorable, glorious prophet and forerunner John the Baptist; the holy, glorious, and praiseworthy apostles; the holy, glorious, and triumphant martyrs; the holy and righteous ancestors Joachim and Anna; our holy and God-bearing Fathers; Saint (Saint of the Day) whose memory we commemorate today, and all the saints. Priest: Blessed is our God, always, both now and forever and to the ages of ages. Lord, I do not know what to ask of You. You alone know my true needs. You love me more than I know how to love. Help me to see clearly my real needs which I do not see. I open my heart to You. Visit and help me, for Your Great Mercy’s sake. Examine and reveal to me my faults and sins. I put all my trust in You. I have no other desire than to fulfill Your will. Teach me how to pray. Pray in me. Amen. People: O Joyful Light! Holy Glory of the immortal Father, the heavenly, holy, and blessed One! O Jesus Christ! Now that we have reached the setting of the sun and have seen the evening light, we sing to God — Father, Son and Holy Spirit. It is fitting at all times to praise You with glad voices, Son of God, the Giver of life. Behold, the universe sings Your glory! Grant, Lord, to keep us this evening without sin. Blessed are You O Lord, God of our fathers, and praised and glorified is Your Name for ever. Amen. Lord, let Your mercy come upon us, O Lord, for we have trusted in You. Blessed are You O Lord, teach me Your commandments. Blessed are You O Master, make me to understand Your commandments. Blessed are You, O Holy One, enlighten me with Your commandments. Lord, Your love endures forever; Do not turn away from the work of Your hands. To You belong praise, song; and glory, to the Father, and the Son, and the Holy Spirit, both now and forever and to the ages of ages. Amen. Priest: Let us complete our evening prayer to the Lord. Priest: That the whole evening may be holy, peaceful, and sinless, let us ask the Lord. Priest: For our Youth Program, all those who participate and help and for their families, that the Holy Spirit may protect and strengthen their faith, let us ask the Lord. Priest: For the completion of our life in peace and repentance, let us ask the Lord. Priest: For a Christian end to our lives, peaceful, without shame and suffering, and for a good account before the awesome judgement seat of Christ, let us ask the Lord. Lord our God Who bent the heavens and came down for the salvation of humankind, look upon Your servants and Your inheritance. Your servants have bowed their heads and bent their necks before You, the awesome and merciful judge. It is not from human beings that they expect help, but from You they hope for mercy and salvation. Protect them at all times, both during this evening and throughout the coming night from every enemy, from every assault of the powers of hell, from vain deliberations, and from evil thoughts. Priest: Blessed and glorified is the power of Your Kingdom, of the Father and the Son and the Holy Spirit, now and forever and to the ages of ages. Priest: Lord, now let Your servant depart in peace, according to Your word. For my eyes have seen Your salvation, which You have prepared in the presence of all peoples; a light for revelation to the Gentiles, and the glory of Your people Israel. 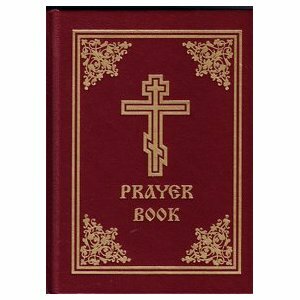 This Internet edition of the Orthodox Prayer Book was compiled for Transfiguration Greek Orthodox Church, Lowell, Massachusetts by Father Peter Gregory. Although some prayers included on this page are original, credit and acknowledgement must be given to the following sources- Daily Prayers for Orthodox Christians (Holy Cross Orthodox Press); The Divine Liturgy of St. John Chrysostom (Holy Cross Orthodox Press); My Orthodox Prayer Book (Archdiocese Department of Religious Education); Mikron Efhologion (Holy Cross Orthodox Press); A Pocket Prayer Book for Orthodox Christians (The Syrian Antiochian Orthodox Archdiocese); Prayers for Eastern Orthodox Christians During Hospital Stay (Rev. Nicholas G. Paleologos); Prayers for Orthodox Christians (Rev. Alexander Leondis). The prayers on this Web Page were drawn together from various sources as a fountain of inspiration for the faithful of Lowell and the Internet Community. This Web Page was prepared in love to be distributed free of charge, so that all may benefit from the Divine proceeds that come from a devoted prayer life. My sincere gratitude to all who “fight the good fight” for the benefit of Transfiguration Greek Orthodox Church- the Youth of Transfiguration, the Parish Council and all our parishioners. This Web Page is humbly offered as an encouragement and guide to our Orthodox Christians to pray and grow in prayer and to continue, in earnest, the work of our Lord.